Finishing, Framing and Birthday Fun ! 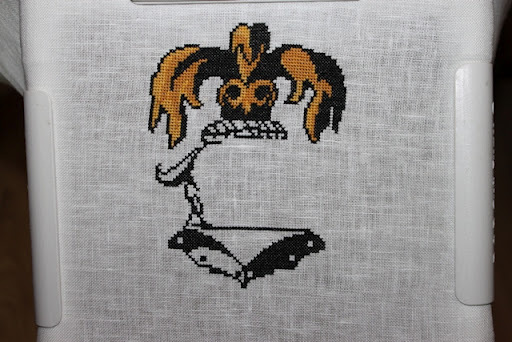 I had started The Sampler Girls piece called My Everything. This was stitched on 28ct Dark Red Jobelan and I used Belle Soie Icing Sugar. 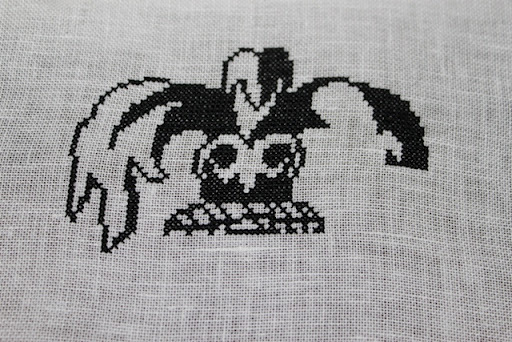 After this I started the Hogwarts Crest for its 10 hour rotation which is now finished. I’m now moving onto Caoimhe’s horse picture. I’ve also got some framing done. Remember the Hunting picture for my hubby. Well here it is all framed ready for his birthday. 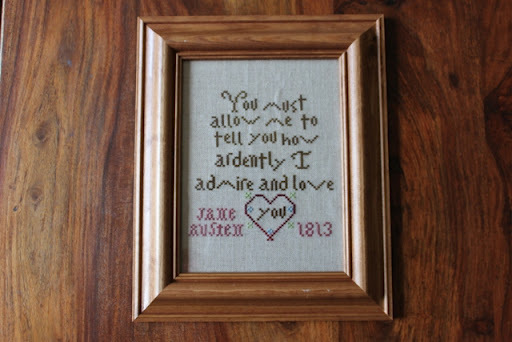 I also got Mr Darcy’s Letter framed and ready for the wall. On Saturday it was my birthday and I got some gorgeous and thoughtful gifts from my family and friends. I wanted sock yarn so hubby and my mum and aunt gave me vouchers for that, I’m still picking out what I want lol. 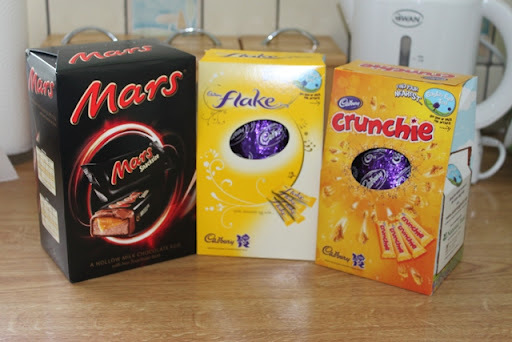 With my birthday being so close to Easter the children wanted to get me some chocolate eggs, this I enjoy as my birthday falls on Easter only rarely, the last time was my 18th which was Easter Sunday then and I got eggs as part of my gifts then to lol. I might add I also got some more after these and some chocolates as well so I now have a nice supply of chocolate to keep me going lol. Hubby and the children also got me some lovely pink roses. 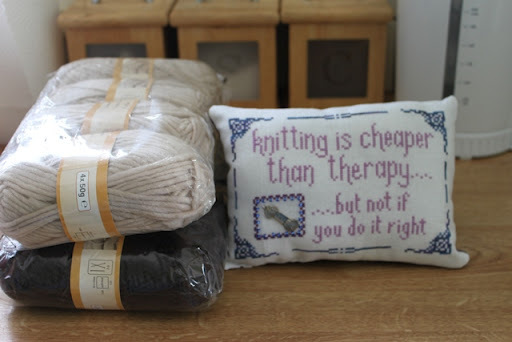 My friend Tricia from Tricia’s Craft Box sent me the cutest cushion and some lovely yarn. 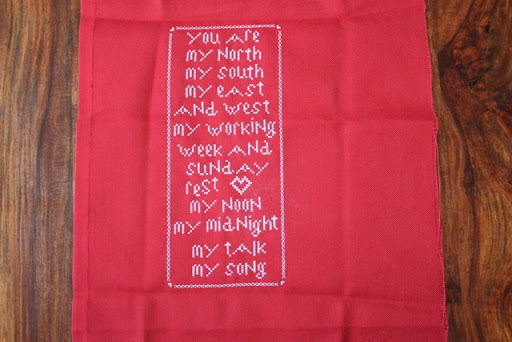 My friend Vickie from A Stitcher’s Story sent me this lovely gift. And what would a birthday be without cake !. 16 Responses to Finishing, Framing and Birthday Fun ! What wonderful gifts! Funny little cushion Tricia, that's good. 🙂 Wow Ruth! What a lovely cake, so pretty. I am glad to see the pinkeep arrived in one piece, uncrushed. 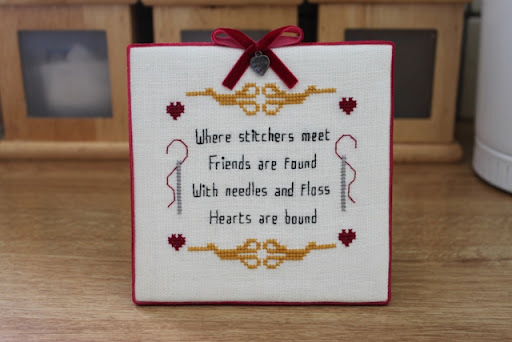 I thought it very appropriate, since we did meet through a stitching group. 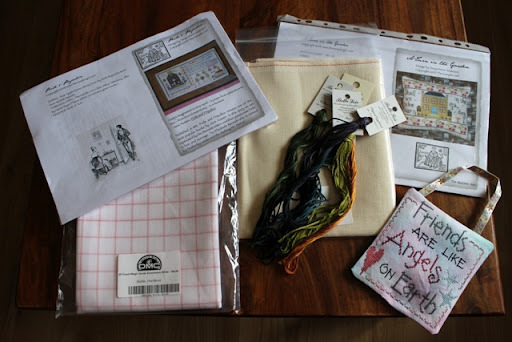 What lovely projects, gifts, & goodies! That cake especially looks delicious! I wish you a very Happy Belated Birthday as well as an early Happy Anniversary! Oh well, who's a lucky girl then :-p All of your projects look great – well done :)Hope you saved me some cake! Belated Happy Birthday wishes – it sounds as if you had a delightful day and lots of gorgeous presents and chocolate too!Well done on your stitching pieces, the framed pictures look wonderful – I am still amazed at how much you get done with such a large and young family. Absolutely GORGEOUS gifts Ruth! Cake looks divine too…… yummmmmmHunter looks fab all framed, and so does Mr Darcy! Happy birthday me dear! Looks like you were truly spoilt, I'm glad! 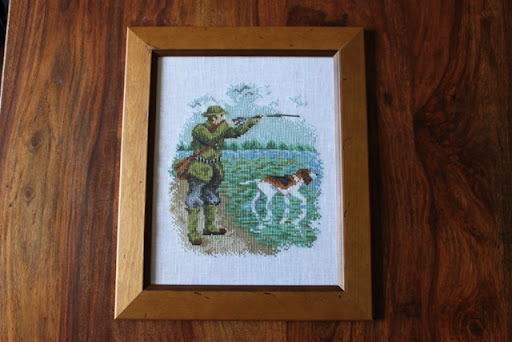 Your gifts are lovely and your cake looks scrummy, jam and cream is about the best I reckon.You've done well on all your finished stitch projects, I especially like your husbands hunt picture with the beagle.Enjoy your spring-clean free week! Happy Belated Birthday!You got some lovely presents and food treats too.Great stitching this post too. I really like the white on red piece. Happy belated birthday! 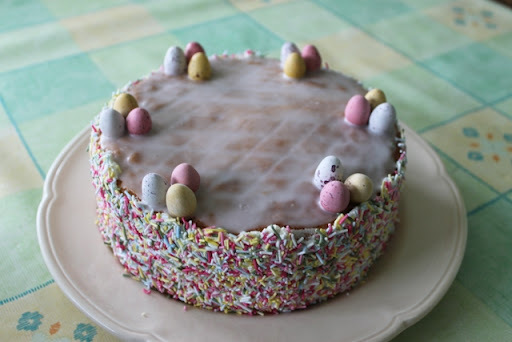 Your Easter cake looks delicious and I love the clean simplicity of the decorations and icing – beautiful!